The Centre is hosting a talk, on Wednesday 26 September 2018, to be given by local historian Peter Bradshaw titled, ‘Gainsborough at War.’ The talk will cover two topics – the Morton Gynes disaster in 1915 and the Shell Filling Factory which was built at Thonock in 1917 to be held at Gainsborough House, 18 Parnell Street, Gainsborough, DN21 2NB. In October 1914 over 4,000 Yorkshire Territorials came to Gainsborough to carry out training before being sent to France. On Friday, 19 February 1915, the town was shocked when seven members of “D” Company of the Fourth Battalion, King’s Own Yorkshire Light Infantry were drowned. 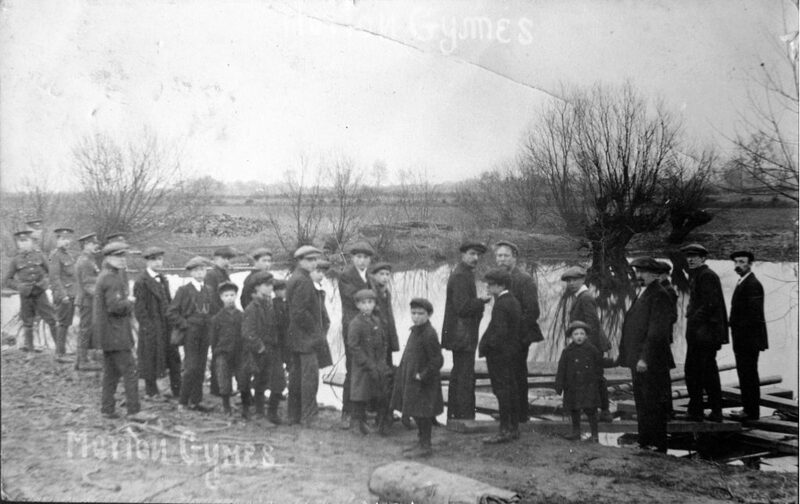 They had gone to one of the gymes (ponds) in Morton, to practice raft building. Estimates of the number of soldiers on board the raft when it tipped over were disputed, some claimed that it was up to 40. Within seconds dozens of men were in the cold, deep water, wearing their heavy uniforms and boots, struggling to survive. Within days of the tragedy the K.O.Y.L.I was removed from Gainsborough and sent to York. By April 1915 they were in the trenches in Northern France. In June Captain Harold Hirst, who had been in charge on the day of the drowning, was shot and killed by a sniper. In November 1917 building started on a 149-acre site at Thonock for the National Filling Factory No.22. It was built to fill mines for the navy. By February 1918 the first “Sinkers” had been filled with 1000 lbs. of TNT (trinitrotoluene) and were sent to Portsmouth. By the end of the war, the factory had used over 2476 tons of TNT. The factory had reached full capacity just as the war ended but it went on for several more years decommissioning munitions and it was the mid-1920’s before the land reverted to farming. The talk will begin promptly at 7.30pm and the cost will be £4 with tea and biscuits available during the interval.